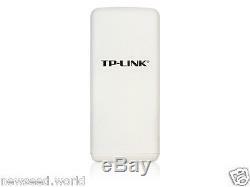 TP-Link TL-WA5210G 2.4G High Power Wireless Outdoor CPE Access Point. The TL-WA5210G 2.4GHz High Power Wireless Outdoor CPE is dedicated to WISP CPE solution and long distance wireless network solutions. It integrates the functions of a Wireless Access Point, WISP Client, high gain antenna and weatherproof enclosure. It features 12dBi high gain antenna, high output power and high RX sensitivity can significantly extend the transmission range to deliver a more stable wireless connection. The TL-WA5210G features high output power and high RX sensitivity can significantly extend the transmission range to reduce dead spots and to deliver a more stable wireless connection. With integrated 12dBi dual-polarized antenna, the TL-WA5210G would help you easy to build up to 15km long range wireless link. If you have higher gain antenna, it also supports distance control from 0km to 52.6km, which breaks through distance limitations in normal 802.11g devices, enables ultra-long distance wireless transmission. The TL-WA5210G provides three operation modes for multiple users to access the Internet: AP client router, AP router and AP. In AP client router mode, it works as a WISP CPE. In AP router mode, it can access the Internet via an ADSL/Cable Modem. In AP mode it can work in various modes, such as Access Point/Client/WDS Bridge/Repeater. With the most attentive wireless security, the TL-WA5210G provides wireless LAN 64/128bit WEP encryption security, and WPA/WPA2 and WPA-PSK/WPA2-PSK authentication, as well as TKIP/AES encryption security. Quick Setup is supported and friendly help messages are provided for every step. So you can configure it conveniently and share the Internet more quickly and easily. High output transmission power and reception sensitivity optimized. 12dBi directional antennas fit for various environments and boost your signal level. Weatherproof enclosure and lightning protection terminal integrated. Supports Passive Power over Ethernet. Supports AP Client Router, AP Router and AP operation mode. Distance Adjustment for long range transmission, up to 50km. Supports Layer 2 User Isolation. Provides throughput monitor indicating the current wireless throughput. Provides WEP, WPA/WPA2, WPA-PSK/WPA2-PSK data security. Provides external RP-SMA connector for higher gain antenna upgrade. IEEE 802.11g, IEEE 802.11b. Wireless Signal Rates With Automatic Fallback. 11g: 54/48/36/24/18/12/9/6M(dynamic) 11b: 11/5.5/2/1M(dynamic). <20dBm (EIRP, For countries using CE Standards). <27Bm (Peak Output Power, For countries using FCC Standards). IEEE 802.11b: DQPSK, DBPSK, DSSS, and CCK IEEE 802.11g: BPSK, QPSK, 16QAM, 64QAM, OFDM. 802.11g 54M: -76dBm 48M: -78dBm 36M: -82dBm 12M: -91dBm 9M:-92dBm 802.11b 11M:-90dBm 5.5M:-92dBm 1M:-98dBm. AP Router Mode AP Client Router Mode (WISP Clent) AP/Client/WDS Bridge/Repeater mode. 15km with Integrated Antenna 50km Maximum (High gain directional antenna required). SSID Enable/Disable MAC Address Filter 64/128/152-bit WEP Encryption WPA/WPA2/WPA-PSK/WPA2-PSK (AES/TKIP) Encryption. One 10/100M Auto-Sensing RJ45 Port(Auto MDI/MDIX, PoE) One external Reverse SMA Connector One Grounding Terminal. Input: Localized to Country of Sale Output: 12VDC / 1.0A Linear PSU. 10.4 × 4.7 × 3.2 in. The item "TL-WA5210G 2.4G HighPower Wireless Outdoor Access Point(5210G)" is in sale since Wednesday, May 11, 2011. This item is in the category "Computers/Tablets & Networking\Home Networking & Connectivity\Wireless Routers".world" and is located in Markham, Ontario. This item can be shipped to Canada, to United States.